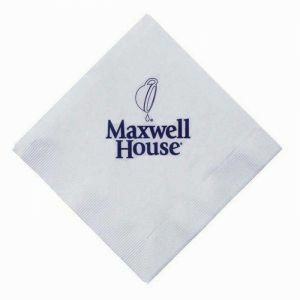 Personalized beverage napkins at PromotionChoice.com are proudly made and printed in the United States of America! 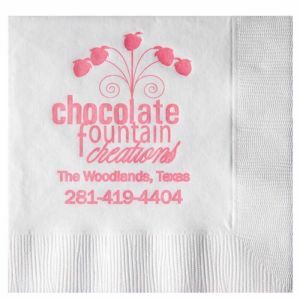 We have super quick turnaround times on our printed cocktail napkins and our prices are cheap and competitive. These custom beverage napkins with logo come in 1-ply, 2-ply, 3-ply, and also in the classier touch of linen or linen-like napkins. 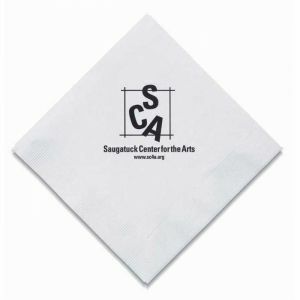 Order promotional beverage napkins proudly bearing your logo or company name from us today! Buy promotional branded beverage napkins from PromotionChoice.com and see us work our magic to bring you a perfectly printed product! Our quality custom beverage napkins have a great feel to them and our print quality is crisp and clean. 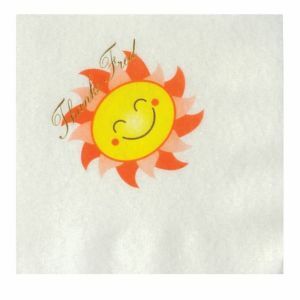 Feel free to ask us a for a free sample of our printed beverage napkins and see it for yourself. 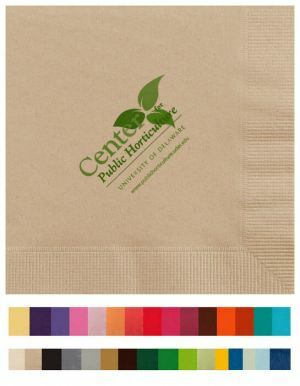 Our logo beverage napkins come in myriad colors such as blue, black, red, light blue, green, orange, purple, magenta, grey, pink, yellow, vanilla, gold, silver, and many more. Some of them even allow for your logo or design artwork to be printed in full color, so your brand name will be even more vivid and striking. When ordering darker colored custom beverage napkins however, we highly recommend that you customize your logo in either black ink or use metallis inks for the best print results. Metallic colored inks are metallic gold, metallic silver, or metallic bronze. Other colors besides these recommended ink colors may not contrast well with our darker colored branded cocktail napkins. Over the years, Promotion Choice has printed millions of branded beverage napkins for countless customers. Many clients return to us year after year as they have been so pleased with the quality of our print jobs on these custom printed beverage napkins. 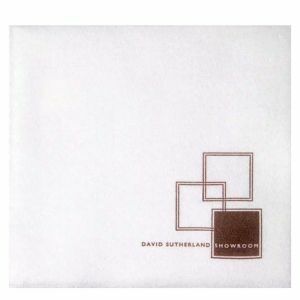 Our branded cocktail napkins have been used for personal engagements and especially for business events. Events such as wedding showers, birthday parties, corporate trade shows, public exhibits, gallery openings, company functions, year end corporate functions, blind taste tests, etc. are all perfect occasions to have custom printed cocktail napkins to showcase your logo or design. Your intended advertising message on these customized beverage napkins will always be at an arm's reach from your target audience at these events. Before you order your imprinted cocktail napkins, spend some time to think about the design of your logo. 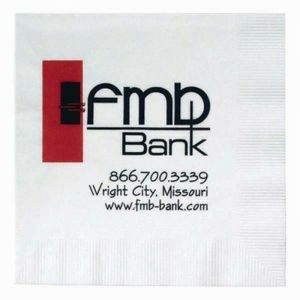 The layout of your logo can make a huge difference in fully maximizing the allowed imprint area of our custom printed cocktail napkins. 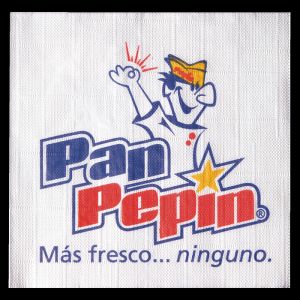 So for example, if the imprint area on our advertising beverage napkins is 3" X 3", a logo that is stacked will be much more aesthetically pleasing than a logo that is long and horizontal. 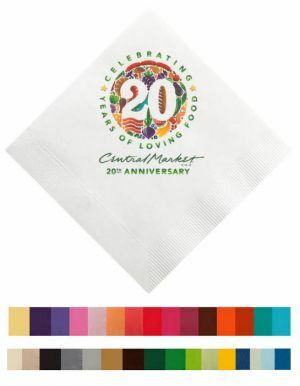 Because whatever the case, the entire logo or artwork for the logo printed napkins will max out at 3" width or 3" height, whichever dimension maxes out first. But do not worry! We have been doing this for years and years and have helped and delighted thousands of customers with our printed beverage napkins. Every order you place with us is always in good hands, and we guide you through the process in its entirety. Our customer service representatives are experienced individuals who know what they are doing, and will call you immediately whenever something doesn't look right or if any details needs clarification on your order of wholesale beverage napkins. We are professionals at creating your custom beverage napkins.